Five in a Series of Five, "God is so powerful, and butiful that Darkness does not stand a chance." Four in a Series of Five, "God has sent me to heal those who are broken hearted." Three in a Series of Five, "Now we will trirr to math"
Two in a Series of Five. "by by sins"
One in a Series of Five. "God allwase has time for us." “Courage is never to let your actions be influenced by your fears” –Arthur Koestler. I have found this to be true on numerous occasions, yet I only began to truly understand what it meant a few days ago when I began to ride my horse, Lady, again. Last spring, when I was really beginning to enjoy riding, I was riding my horse Lady up to the barn when she threw me off. Now this was not a big deal, I was a little sore but could easily get back on the next day. A week passed before I could get back on her again, and for a while everything seemed fine. Then Lady bucked. I went flying over her head and landed on the ground. Now normally this wouldn’t have been a problem either, you get up and get back on. But after being thrown twice in a row, I was scared. For a month I wouldn’t get even close to Lady. And for nearly eight months I didn’t ride. My fear made me oblivious to the possibility that, perhaps, it wasn’t Lady’s fault. "This is what my brain looks like when there are too many emotions and sounds and my brain gets a glitch it in and shuts down." "And this is what my brain looks like when God (in yellow) comes in and tells me it's OK and to be still. His eyes say, 'Peace.'" Daren, "God cried too, when Jesus died." Thank you, Gregory! I could live on that last sentence for a decade. I can't tell you how many times I have asked children, "Are your listening ears on?" (As if they had a second set that weren't exactly for listening... oh the stupid things adults say to children-- I digress.) This year at Good Dirt we are introducing a series of blog posts called "In Their Own Words... or Pictures." We have our listening ears on and we want to hear what children have to say about God. We'd love to see their picture, sculptures, poems, and narratives. Whatever they want to use to carry their voice, we'd love to see. Our listening ears are on! "When bad things attack you-- God creates a force field." Thank you, Ella Green, for reminding us that light does shatter darkness. "God is reaching for me." Sipping on hot chocolate with Jesus and in love. Yesterday I introduced our new blog series for the next year; where we are encouraging children to speak in their own words about God. As we begin this time of listening, we (adults) have to remember that children are having a relationship with God even if they can't articulate it. The Holy Spirit is hot on their heels from their beginnings, inviting them into a relationship with the already relational Trinity. The Spirit is both a fire that warms and convicts, and an ever present wind inviting them to play. Due to developmental levels, children often can't communicate exactly what they are thinking and feeling, but that doesn't mean there is nothing going on. 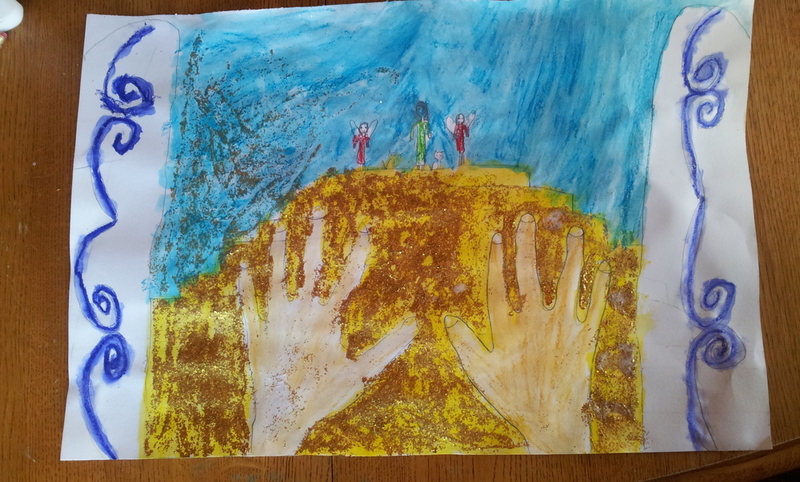 The concrete nature of drawing can provide a space for children to express themselves. Inviting a child to draw and color their response will open a window for us to see and learn from them. And we are learning. They have much to teach us about life with God. They are more open to the present moment and mystery than most of their adult counterparts. In a sense, we lost what they still have. Jesus said that the kingdom of heaven belongs to these little ones and if we want in on this glorious life with God, we're going to need a few pointers from children. So how do we open the window a bit? 1. Create a safe space. Safe spaces are spaces where we can say anything. Anything. What they believe about God, just is. Notice what they are saying/drawing without judging. Phrases like "This is interesting, can you tell me more?" can be helpful. Resist the urge to use words like "good" or "bad." 2. Break the boxes. As adult Christians we like our theology in neat and tidy packages. Children don't care one flip about tidy. They don't care about it when they wipe a booger on your sleeve and they don't care about it when they talk about God. THIS is not the time to teach them. THIS is not your time to speak. It's theirs. Let them. Listen. 3. Listen for the fingerprints of God. Before we have a "tidy" theology (that God will eventually break apart and rebuild around the second half of our lives) we are more aware of his fingerprints. His fingerprints look like beauty. Children notice the beautiful and they call it God. The fingerprints also look like goodness, this, they also call God. And truth... while they will lie all day about who broke the lamp, they are especially tuned into the truth as it pertains to justice, they also call this God. You won't want to miss these! 4. Give them a variety of choices of mediums with which to communicate. How about writing a poem? A narrative? Draw a picture? Gotta dance? Send us the video. How about a sculpture with silly putty, or clay, or mashed potatoes? Go for paint! There is something about watercolors and children. I don't know if it's because they are so forgiving or if the mess is just right, but put a little music on-- ask a question and see what they communicate with color. 5. Questions to get you started... Keep in mind that this is an invitation. Invitations can be turned down. If children don't want to share. Don't make them. (Frankly, you can't make them. They may give you "something," but it won't be what's in their soul.) When they are ready to share, they will. Here are a few invitational questions to try. Would you draw/ write a poem about you and God? When did you see or hear God today? Would you tell about a time when God was with you? When did you see something that was good, or beautiful, or true today? Read any passage in one of the four Gospels where Jesus is interacting with a person. His healings and interactions with children can be particularly moving. Invite your child to draw "the best" part of the passage. Or invite them to write a letter to Jesus about it. What would they say to him? One last thing, ask your child's permission before passing on anything they have shared. These conversations are sacred and must be treated with honor. Ok. Two last things. We are only getting a glimpse. There is a depth of relationship between a child and God that you can never see and never understand. Get used to it. Be uproariously grateful for the bit they let you in on.